Copper miners will be the first metal producers to feel the impact of growing electric vehicle demand, says company executive Arnoud Balhuizen. The electric car boom is at a “tipping point” this year, and according to BHP Billiton (ASX:BHP,NYSE:BHP,LSE:BLT), copper miners will be the first metal producers to feel the impact. The shift to electric cars is happening faster than many expected, with several countries announcing plans to ban all fossil fuel cars, and sales anticipated to reach into the millions in the next decade. BHP, the world’s largest miner, estimates that the global electric car fleet could rise to 140 million vehicles by 2035, up from roughly 1 million vehicles at present. There are about 1.1 billion cars in total on the road today. “In September 2016 we published a blog and we set the question — could 2017 be the year of the electric vehicle revolution? The answer is yes … 2017 is the revolution year we have been speaking about. And copper is the metal of the future,” BHP Chief Commercial Officer Arnoud Balhuizen said on Tuesday (September 26) at a Reuters event. As mentioned, Balhuizen and BHP believe that copper miners will be the first metal producers to feel the impact of the electric vehicle boom. Supply is seen struggling to match increased demand as fully electric cars require four times more copper than vehicles with internal combustion engines. Supply is also expected to be a factor. That’s largely because the world’s top copper mines are aging, with no major discoveries made in two decades. Speaking recently with the Investing News Network, Paul Benjamin, research director at Wood Mackenzie, said BHP and OZ Minerals (ASX:OZL) are two copper companies that may be able to help prevent a significant deficit from emerging. He pointed out that BHP is planning on spending $2.5 billion to extend the life of the Spence mine in Northern Chile by more than 50 years. However, he doesn’t see electric vehicle demand having an immediate impact on the copper space. “[T]he EV story is generally positive for copper over the long term. Both in terms of the metal used in the vehicles themselves and also the power distribution infrastructure required to charge the batteries,” said Benjamin. However, it will probably be the middle of the next decade before global adoption of electric vehicles increases enough to have a significant effect on copper demand. That said, many other market participants remain bullish on the electric car boom and its impact on copper. 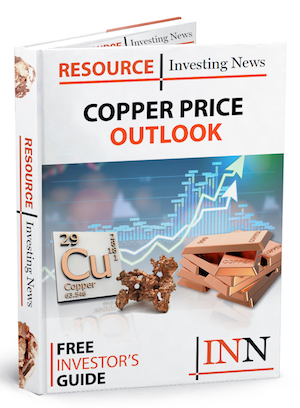 Earlier this year, billionaire mining investor Robert Friedland explained why he believes copper will continue to outperform gold as the revolution unfolds. Click here to read the full article. On Tuesday, LME copper closed down 0.6 percent, at $6,411 a tonne. Prices hit their lowest level since mid-August on Friday at $6,366.